Getting your point across to your audience or team in exactly the right way can be challenging, and can have a significant impact on personal success. As we all know, the cost of miscommunication can be significant! Enhanced communication skills can help you increase team morale, team productivity and personal productivity, while bringing about greater levels of workplace engagement and customer satisfaction. Our communication-related training and coaching is conducted in a positive style geared toward building upon strenghts, and is customized to best-fit your situation, goals and objectives. On-site and interactive remote options are available. Would you like to master the art of running consistently dynamic, interactive and productive meetings, training sessions or teleconferences? A national poll recently uncovered the fact that only slightly more than half of all business meetings in the U.S. are considered productive. The challenges mount quickly when moving to the virtual forum, yet an ever-increasing number of organizations are relying more on remote communication, team meetings and training in an effort to manage tightening travel budgets. If you'd like to boost efficiency and team spirit, we can help raise your communication awareness and skill levels, and introduce proven techniques for conducting lively, productive meetings and teleconferences of all types. Do You Manage a Remote Team? Technology, practicality, and emerging workplace cultures have brought about the need for leaders at all levels to master remote management and communication skills. An increasing number of today's sales presentations are even made via various web-based platforms. 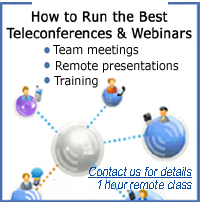 As many have acknowledged, running an effective teleconference, remote meeting or virtual presentation is much more challenging than leading a face-to-face session. How do we engage the audience? What can we do to keep their attention? What's the secret to maintaining interaction levels? We can help you answer all of these questions and more, and to take these sessions to a new level of success!